Greece was at the epicentre of both the Eurozone and migration crises, but as Gemma Bird and Amanda Russell Beattie write, each crisis has left a notably different mark on the country. Nowhere is this more evident than in Greek migration policy, where efforts to welcome investment and workers from abroad stand in striking contrast to the treatment of those currently stuck in reception centres and refugee camps. 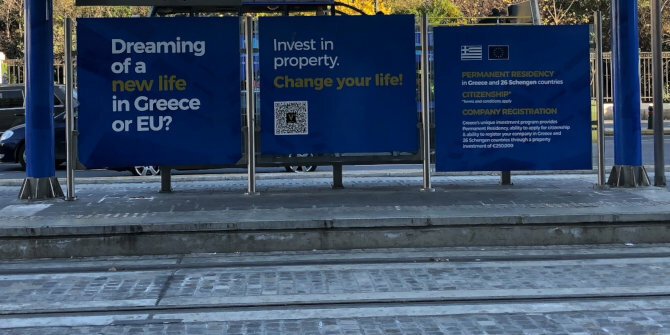 In contrast to this advertisement for new citizens willing and eager to invest in the country, Greece also houses 69,300 refugees and migrants according to UNHCR figures (accurate as of November 2018). Standing in stark contrast to the welcoming messages of the signs outside Parliament is the treatment of a group of people struggling to make new lives within the borders of the European Union, having entered Greek territories as refugees and asylum seekers. Of the 69,300 people, 16,000 of those are living on the islands and a further 53,300 living on the mainland. Based on conversations with activists and volunteers it becomes very clear that this number is in fact higher, with a number of people unaccounted for, particularly when they reach the mainland, where they can find themselves existing outside of the formal support sector. Whilst the UNHCR provides accommodation across Greece in either shared buildings or apartments, this system only currently has 55,755 spaces within it. A drop in the ocean when considering the number of people currently housed in reception centres and refugee camps on both the islands and the mainland. On the island of Samos, for example, there are only 252 spaces available in UNHCR housing and estimates suggest between 4,000 and 5,000 people are currently ‘stuck’ on the island, waiting for an asylum process that will last months, if not years. As individuals wait for this process, which can take over a year, with limited indication of when a first meeting will take place and little logic, we have been told, as to who will be transferred from the islands to the mainland and when, without a level of vulnerability that must be demonstrable and proven, those still waiting for the process to happen for them have limited choices as to how to move their lives forward. A system that is looking for new citizens does not provide the space for individuals ‘stuck’ in Greece to work, to learn in a formal environment or to contribute to wider community aims. On the island of Samos, for example, children are not currently able to attend school within the Greek system, relying instead on a number of voluntary organisations who provide schooling for different age groups to try to fill the gap in this very significant period of their lives. For adults in Greece, they too must rely on voluntary organisations which put on language classes, music lessons, lend books, and organise film nights in acts of solidarity and community to populations spread all over the country. Yet people currently stuck in reception centres may have, in a different global environment, been just the people that the Greek government are looking for to become their new citizens. In our time spent in the region since the summer of 2017 we have met, or heard the stories of, university students, professors, teachers, professional performers, medical professionals, carpenters and electricians, amongst many more, all of whose skills are being ignored, set aside to atrophy, whilst they await an asylum process that, may or may not, eventually ask them to become citizens of the state. In Greece we see a story of two migratory systems, the first that is welcoming and open, asking for investment and participation in the economy. Yet this migration system is open only to a particular group, a group that has wealth yes, but also one that holds the ‘right type’ of passport. In contrast, we see a second system, one that restricts and places lives on hold. A system that places people in over crowded conditions, that requires them to queue for, we have been told, five hours to receive one of three meals handed out per day, to live in tents in torrential rain storms, to defend not only why they left their country of origin but then also why they have left Turkey. A system that runs out of clean and dry sleeping bags, one that requires women and children to walk 15 minutes to a toilet that even then is unsafe for many reasons, one that accuses rather than welcomes, is firmly closed rather than open. Greece, and Europe more broadly, acts as a microcosm for a world dominated by two models of migration, the one that welcomes and the one that ‘others’. Gemma Bird is a Lecturer in Politics and International Relations at the University of Liverpool.